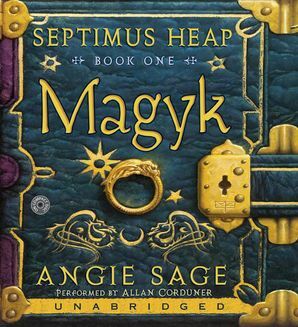 The first book in the internationally bestselling Septimus Heap series by Angie Sage, featuring the funny and fantastic adventures of a wizard apprentice and his quest to become an ExtraOrdinary Wizard. Septimus Heap, the seventh son of the seventh son, disappears the night he is born, pronounced dead by the midwife. That same night, the baby's father, Silas Heap, comes across an abandoned child in the snow—a newborn girl with violet eyes. Who is this mysterious baby girl, and what really happened to the Heaps' beloved son Septimus? The first book in this enthralling series by Angie Sage leads readers on a fantastic journey filled with quirky characters and Magykal charms, potions, and spells. Magyk is the original story of lost and rediscovered identities, rich with humor and heart.